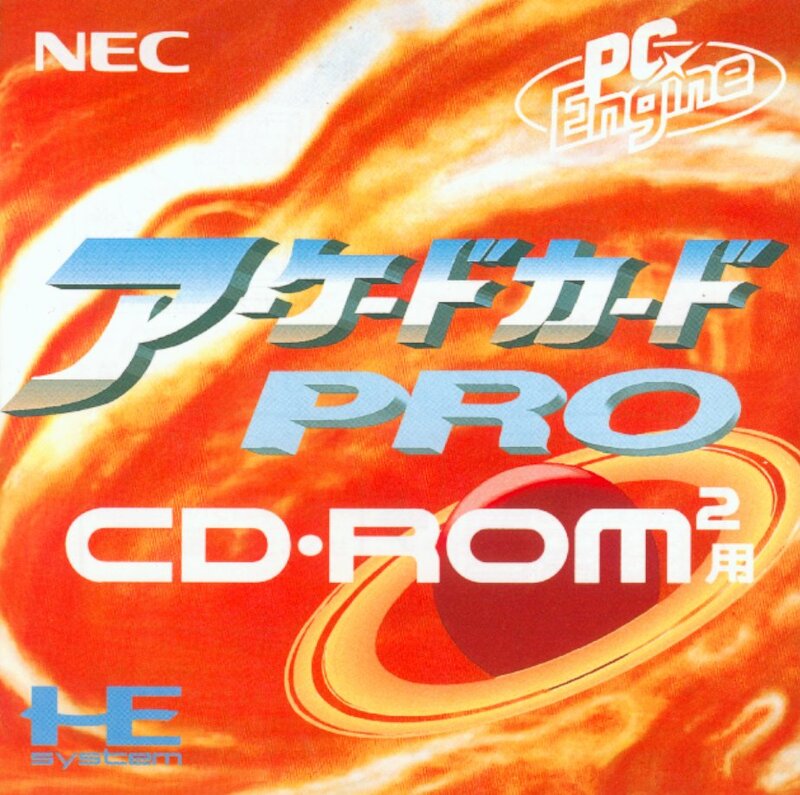 The Arcade Card is an expansion HuCard for the PC Engine intended to be used with the CD-ROM² hardware. The card comes in two varieties one with 256Kb extra ram and the Super CD-ROM² System 3.1 BIOS for non-Duo PC-Engines called the Arcade Card Pro and one without the extra ram to be used in a Duo called the Arcade Card Duo. 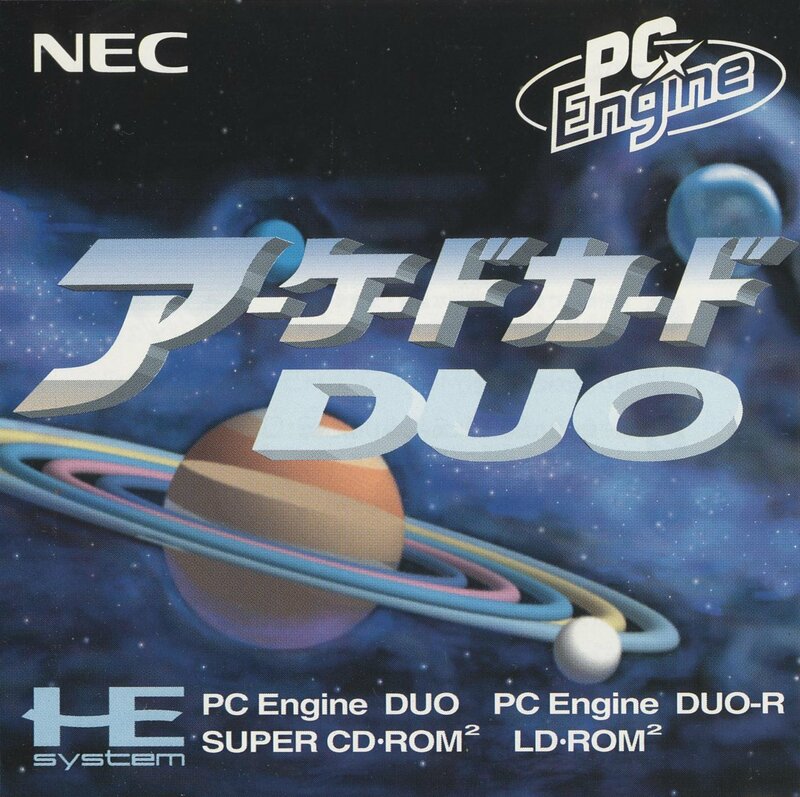 It is unknown if the Duo version of the Arcade Card contains the CD-ROM² BIOS. Both types come with an additional 2 MB of non-memory-mapped RAM, a collection of registers to access the aforementioned 2Mb RAM in various patterns and a 32-bit-wide programmable shift register. The Arcade Card has 4 individual port registers to access the 2 MB of memory. Each are their own index in the memory and can overlap without conflict. Four sets of memory mapped registers. Each port register consists of the following. 2/3/4 Base address of the 2 Megabyte range. Format is 24-bit: low, middle, high byte. 5/6 Offset register. Format is 16-bit LSB/MSB. 7/8 Increment register. Format is 16-bit LSB/MSB. 7654 3210    All eight bits of the Control register. 10 Manual Offset Trigger. Any write to this register triggers adding the offset to the base address. The Data port register acts as an address register. It uses the value of the Base register for the address calculation, to point into Arcade Card memory. All access to the Arcade Card memory goes through these register sets. Depending on which bits are set in the control reg, different address calculation configurations can be used. You can have the Offset register index the Base register. You can also configure to have either the Base or the Offset register auto incremented or decremented on access to these Data registers. The Offset register is basically a 'window' or 'index' register. It can be configured to be added to the Base register at the time of address calculation for memory fetch/store operations. It does not accumulate back into the Base register on every Data register access. When D1 of Control register is set, it functions as above. There are some other behaviors that can be applied with Offset register. With byte 10, you can have the Offset register value added to the Base register. This is different than above and happens on each instance of writing to register byte 10. This is a manual triggered add function. The value written to byte 10 is irrelevant. The Base address accumulates the Offset register's value. If D6/D5 of the Control register are set to anything other than %00, the above add function is applied to Data port access. In some instances, this is redundant as it acts the same as the Increment register. But it can be configured so that the addition takes place on only one byte of the Data register set. This can be useful for incrementing on WORD size read/writes. Control register-bit D3 defines how the 16 bit value of the Offset register is used. If this-bit is set, the Offset register value is treated as a signed number. This applies both to indexing function and add functions. Control register bits D2 and D3 effect how Offset and Increment register values are treated. When set to signed, the value is 2's complement. Signed status shouldn't have any effect when the Increment reg is added to Offset register. Both are 16 bit and added normally as signed with or without the signed status. Where the-bit does come into play, is when either the Increment or Offset register (or both) are added to the Base register. Since Base is a 24 bit value, and the Offset and Increment register values are 16 bit, these are signed extended to 24 bit before being applied to the Base register. When the Control register-bit D0 is set, auto-increment function takes place upon every read/write of the Data register set. The Increment register holds the value, to be added to another register. Control-bit D4 sets which register is going to be 'incremented': the Base or Offset register. Control register-bit D2 sets whether the Increment register value is sign extened to 24bit or not, when adding to the Base register. When Control register-bit D4 is set to 'Offset', the Increment register is added to Offset register. The Base register isn't effect. Fatal Fury Special uses this Arcade Card register block as a 16-bit down counter. ora $1a16     ; <- if both LSB and MSB of Offset is $0000, then loop finished. First read ($1a10) increments Offset by -1. ORing LSB/MSB of Offset, if the result sets the Z flag (both are 00) then finish, else jump back (continue loop). These registers have specific memory locations and not groups like the previous mentioned set of registers. $1AE0 4 bytes A 32-bit register. Format: lowest, low, mid, high byte. $1AE4 1 byte Amount to shift the 32bit register. Lower four bits value is signed. $1AE5 1 byte Amount to rotate the 32-bit register. Lower four bits value is signed. $1AEC 2 bytes Should return $00/00. $1AFE 1 byte When read, gives the version number of the Arcade Card. $1AFF 1 byte Arcade Card ID = $51. Used to detect the card. The last byte ($1AE3) is a latch. When this is written to, all four bytes are copied into an internal 32-bit register. Reading back from this last byte, also activates the latch mechanism. I.e. you can write to one of the lower 3 bytes, and then read from the last byte to update the register. The value in the 32-bit register is always treated as unsigned when the shift logic is applied. The register is 8 bits but only the lower 4 bits are used for the shift/rotate operation. The upper 4 bits are still held in the register, and can be read back. The lower four bits are signed, so it controls the direction of the shift/rotate. Only writing to these two registers activates the shift mechanism/logic. Four banks of Data registers mirrored through out 8k. Each bank corresponds to one of four Address register sets. $40 Data registers 0/1 of $1A00 mirrored in the 8k bank. $41 Data registers 0/1 of $1A10 mirrored in the 8k bank. $42 Data registers 0/1 of $1A20 mirrored in the 8k bank. $43 Data registers 0/1 of $1A30 mirrored in the 8k bank. The mirrored registers served a specific purpose. They allow you to use the Txx block transfer instructions with the Data register ports. The are no port-to-port block xfer instructions. In order to get Arcade Card port reads to VDC port writes, you need a special Txx instruction that just doesn't exist. A clever work around is to organize a set of ports, so that you can read them out in sequential fashion - like that of normal sequential linear addressing. These ports, are mirrored one after another for a single 8k block. It works both for VDC to Arcade Card and Arcade Card to VDC, although the bigger benefit is actually for transferring to VRAM. Each bank of $40-43 corresponds to one of four sets of Arcade Card Data registers. This also means you are limited up to 8KB in a Txx single instance. So you'd have to you remap the *same* bank number to the next page register(s), for larger than 8k transfers. If you want to transfer data to vram, you use the normal [] instruction. And reading from VRAM to Arcade Card, you use the TAI instruction. byte 9 control reg bitmap-bit 7 n a-bit 6 allow writes to byte 6 to add offset to base but only if-bit 5 is clear. -bit 5 allows writes to byte 0xa to add offset to base but only if-bit 6 as well. This page was last modified on 12 January 2015, at 21:52.